Like most of the Europa League campaign this was a game which won’t go down in the annals as particularly memorable from a footballing perspective. It was a routine win from a team which barely needed (or wanted) to get out of second gear, but it provided us with three things we haven’t had in a while. 1 – An away win: Remarkably it’s our first win on the road in 2018, the last coming in the 3-2 win over Crystal Palace at the end of December. 2 – A clean sheet: There was to be no Spud from Trainspotting moment despite the difficult conditions and unusual pitch in Sweden. David Ospina plunged like a jungle cat to his right to stop the absolute cannonball of a spot kick by Tom Pettersson, the first time an Arsenal keeper has made a penalty save outside of a shoot-out since March 2014. Seriously. He went straight into the dressing room afterwards and WhatsApp’d the crying laughing emoji to Cech. The Colombian was, rather strangely, captain for the night when I thought it would go to the more senior Nacho Monreal, but you can never second-guess Arsene Wenger when it comes to anything. The Spaniard scored our first goal as we dominated the early part of the game. I’m not sure if Östersund were overawed by the sight of the Arsenal players or our reputation, but they spent the first 20 minutes or so looking terrified and camped as deep as possible in their own half. At around the 15 minute mark we had enjoyed over 85% possession. There were some shots, some decent defending, but we had a goalkeeping error to thank for the opener. Alex Iwobi’s effort should have been routine for Aly Keita but he fumbled the ball and Monreal was there to poke home. That’s three goals in six games for our most potent attacking player at the moment. The lead was doubled not long afterwards when a Henrikh Mkhitaryan cross hit some bloke on the upper arse and went in for an own goal. At that point, Arsenal kinda took their foot off the accelerator they’d barely had their foot on in the first place, and home side realised they didn’t have that much to be scared about so they came out to play a bit. Ospina had to make an excellent save as they grew in confidence but in truth they always looked like they lacked the final bit of craft to make really dangerous chances. The third goal came just before the hour mark when Mkhitaryan found Ozil in the box and the German’s shot squirmed under the keeper who might have to be renamed Alymunia, and that was really that when it came to the result. We knew it, they knew it, and the rest of the game played out accordingly. How different it might have been if the referee had awarded the penalty they should have been given just before our third goal – when Mustafi clearly brought the bloke down in the box – we’ll never know. But that’s the way it goes with penalties. Sometimes you get them, sometimes you don’t. Sometimes you’re harshly punished for nothing much, sometimes you get lucky. 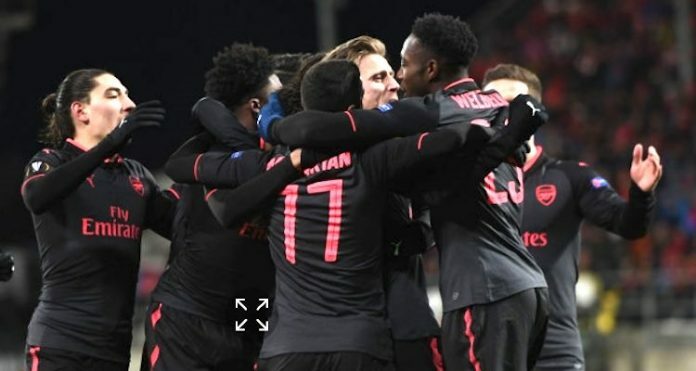 There was a penalty late on, obviously, Hector Bellerin can’t really have any complaints but then it brought about that magical wonder-save from Ospina, the clean sheet remained intact – as well as the three goal lead going into the second leg next Thursday. I think we adapted quite well to the pitch. They were maybe a bit cautious at the start and we took advantage of it. I feel at 2-0 at half-time, it was important for us not to concede a goal and win the second half. I felt there was room to score one or two more in the second half but we were in control and once we went 2-0 up, overall we won in a comfortable way. It was nice to see Ainsley Maitland-Niles get a run out in midfield and while you have to be cautious of the quality of the opposition and the small sample size we have with him in there, I thought he was tidy and looked confident. There’s obviously still a bit of learning to do but he’s been blooded in there now and if he’s there to compete with the others then I’m good with that. Up front it didn’t quite come off for Danny Welbeck who looked rusty, to say the least. Perhaps it was the pitch, perhaps the conditions, perhaps the first start since he returned from injury, but he’ll have hoped to have made a bigger impact that than. Overall though, job successfully done, no injuries that we know of from the pitch, and it’s a comfortable lead to take into the second leg. It might also give Arsene Wenger a chance to rest a couple of key players ahead of next weekend’s Carabao Cup final against Man City, so that’s a positive too. Anyway, for more discussion on the game, some of the individuals and more, I’ll leave you with a piping fresh Arsecast with Andrew Allen and Tim from @7amkickoff. News throughout the day on Arseblog News, and more from me tomorrow as we head into an Arsenal-free weekend.